Just Shutters provide stunning interior shutters for windows and doors across Cardiff and South Wales. Window shutters Cardiff by Just Shutters – combining quality, style and value. Call us on 0845 894 0700. Plantation shutters are a versatile and super stylish window covering. Shutters combine beautiful designer looks with a multitude of practical benefits. Shutters are so very fast becoming the window covering of choice. Having made their mark with designers, hotels and glossy magazines, homeowners are following suit and as such, the shutter market has grown by over 40% in the past decade as savvy buyers realise their great benefits and value. At Just Shutters we stock the UK’s largest, and arguably the most stunning, range of shutters. Browse our photo galleries to get inspired about the possibility of shutters in your home! Then take at look at our range of products and materials to see how shutters could practically fit into your home. – Value – adding long term value to your home. 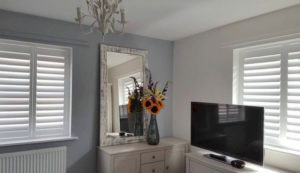 Just Shutters are a much-loved and trusted specialist shutter company, overall the most reviewed and recommended in our areas on Checkatrade, we pride ourselves on our second-to-none quality and service. Window Shutters Cardiff are our one and only focus, so they are not a side-line or add on, they are our craft. To find out more about the Just Shutters difference please contact us and experience our passion for shutters and our customer service for yourself. Please feel free to browse our price calculator pages, download a brochure and be inspired by our galleries. For further information, for a home visit or a postal brochure please give us a call on: 0845 894 0700. We look forward to hearing from you. We can of course sing our own praises all day long, but we would far rather hand over to our customers! I am extremely pleased with both work and service. New plantation shutters fitted to front bay window.